Rather than having a lazy Sunday, I was up before 9 and off to a Speedo Dive In event at my local Total Fitness gym. The whole idea behind the Dive In events is to help people progress their front crawl, and after the advert popped up in my newsfeed a few weeks ago, it sounded almost too good to be true. It’s not often free swimming lessons come about is it? 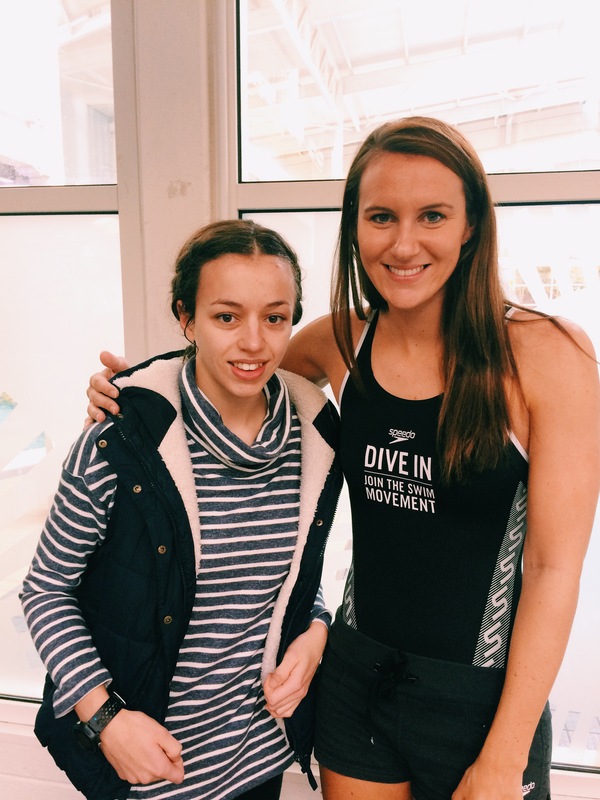 Especially with double Olympic Silver medalist, Jazz Carlin. I’m not a very confident swimmer and never have been, my recent attempt at open water swimming is enough to demonstrate that! However, with having ‘compete in a triathlon’ on my bucket list…it’s something that needs to change. After being introduced to the #GetSpeedoFit team we split into groups from beginner through to advanced. Only just being able to manage one length…I was best suited in the beginner group. With two coaches, the front crawl was broken down step by step. First it was the legs, then breathing, arms and then a case of putting it all together. One thing I found particularly useful was the use of training aids to help improve your swimming. It meant I could just concentrate on one part of my stroke rather than trying to figure it out all at once! I’ve always struggled with my breathing in swimming, but when it came down it there were a few things wrong with my stroke that made the breathing difficult. So rather than blabber on, what did I actually learn? – Kick from the hips. – Always keep one ear in the water when breathing. – Breath just as you take your hand out of the water. – Don’t get lazy at the back of the stroke, push with your hand right up to the point it leaves the water. – ‘Traintrack’ arms…rather than putting your hand in the water just in front of your head (like me!). – Make your stroke as long as possible. And…I need training aids for when I go swimming! If you’ve got a Speedo Dive In session coming up soon near you, I would definitely recommend going. From advanced swimmer to someone looking for a rewarding sport to keep them fit, there’s plenty to learn for everyone regardless of ability. I came out of the session with a lot more confidence in my swimming than when I went in. With plenty more motivation to get back in the pool, competing in a triathlon might not be as unattainable as I first thought. I’ve also been today and I was brilliant. It was such a good thing to be a part of!